Horticultural Plant Breeding is a complete and comprehensive resource for the development of new cultivars or clones of horticultural crops. It covers the basic theories that underpin plant breeding and applies Mendelian, quantitative and population inheritance practices in smaller populations where the individual plant has high value. Specific traditional breeding methods are also covered, with an emphasis on how these methods are adapted for horticultural species. In addition, the integration of biotechnologies with traditional breeding methodologies is explored, with an emphasis on specific applications for fruits, vegetables and ornamental crop species. 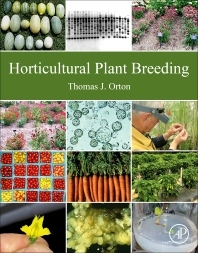 Presented in focused sections, Horticultural Plant Breeding addresses historical perspectives and context, and genetics as a critical foundation of plant breeding. It highlights treatments of the various components of breeding programs, such as breeding objectives, germplasm, population engineering, mating systems, enhanced selection methods, established breeding methods applicable to inbreeding and outcrossing situations, and post-breeding activities.